Save the date: Saturday 22nd September 2018. 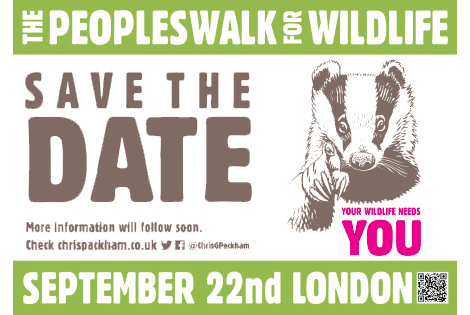 We’re asking supporters to join Chris Packham for the first People's Walk for Wildlife in central London. The event is to bring people together in their shared love of wildlife to create a unified, stronger and louder voice for making the changes so urgently required to conserve and protect our wildlife. It will, of course, be a peaceful event for all including children, young people and families. There will be no banners - just birdsong and creativity. It's up to us to protect our wildlife and ensure we have a world where all life can flourish. Details to follow soon. For background here is the full video about the walk.